Incorporate optimal therapeutic regimens for individuals with multiple obesity-related comorbidities. Compare the safety and efficacy profiles of current and emerging anti-obesity medications so that potential risks and benefits are considered when planning treatment. Incorporate effective communication with patients regarding weight loss and anti-obesity medications to improve treatment outcomes. Obesity has increased dramatically in the past 20 years, and is considered a health care epidemic in the United States. One-third of adults in the United States are considered obese, having a body mass index (BMI) ≥30 kg/m2, according to the US Centers for Disease Control and Prevention. Serious health concerns associated with obesity include increased risk for hypertension, stroke, coronary heart disease, dyslipidemia, type 2 diabetes mellitus (T2DM), depression, sleep apnea, osteoarthritis, infertility, as well as cancers of the colon, breast, and endometrium. A BMI of ≥ 35 kg/m2, increased waist circumference, and waist-to-hip ratio are predictors of increased risk for mortality. Evidence suggests that losing even 5% of body weight can produce clinically relevant decreases in insulin resistance, decreases in blood pressure, and improvements in lipid profiles. Although some patients will successfully achieve weight loss with changes in diet and exercise alone, these patients represent the minority, and a significant percentage of patients who are successful are unable to maintain weight loss over time. Staying current with evidence-based recommendations for treatment, including knowledge of the safety and efficacy of emerging therapeutic options, is vital to health care practitioners as they work with patients to develop optimal, individualized, long-term strategies for overcoming obesity. 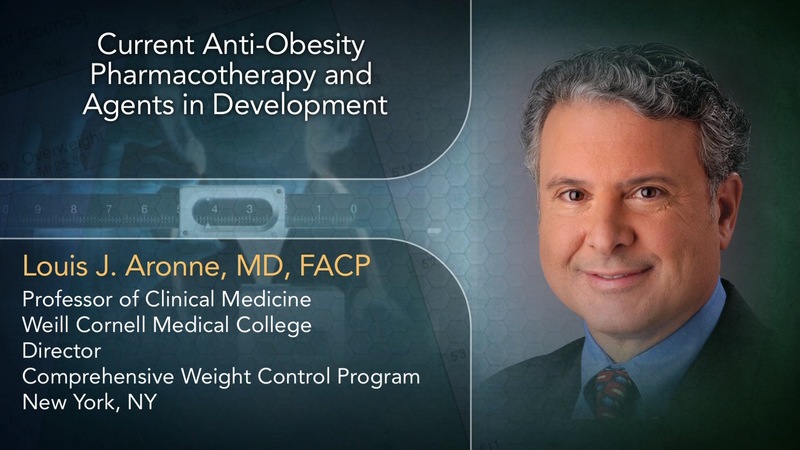 This program will consist of a series of four video vignettes presenting interviews with clinical experts who will explore some of the most pressing issues in the management of patients with obesity. Consulting Fees: Amylin Pharmaceuticals Inc., Arena, Eisai Inc., Ethicon Endo-Surgery Inc., GlaxoSmithKline, Novo Nordisk, Orexigen Therapeutics Inc., VIVUS Inc., Takeda Pharmaceuticals Inc., Zafgen Inc. Ownership Interest: Cardiometabolic Support Network LLC, Myos Corporation, Zafgen Inc. Consulting Fees: Alkermes, Boehringer Ingelheim, Daiichi-Sankyo, Eisai, Johnson & Johnson, LipoScience, Novo Nordisk, VIVUS Inc. Speakers Bureau: Amylin Pharmaceuticals Inc., LipoScience, Merck & Co., Inc.
Fees for Non-CME Services Received Directly from Commercial Interest or their Agents: Amylin Pharmaceuticals Inc., Eisai, LipoScience, Merck & Co., Inc., VIVUS Inc. Ownership Interest: ISIS, Lilly, Merck & Co., Inc., Novartis, Pfizer, VIVUS Inc.